TFL Season 8 is Officially Underway! The league season has officially begun! Each player has received rod levels (78 levels for 13 team Blue Division or 84 levels for 14 team Red Division) for the season to spend as they see fit. If you don't see a match for your team immediately, your team may have a bye week. The first match must be completed by the end of Sunday, March 23rd. The results of those matches will be posted next Monday. Good luck to all teams this season! If you would like to participate in the Team Fishing League, please register by midnight PST tonight! Registration for the TFL ends Sunday, March 16th, so if you haven't registered yet, you can sign up at Tribute City or Alston! If you need any help with registration please contact Sweegy Manilow. TFL Season 8 Registration is now open! TFL Registration is now open in Tribute City and Alston! Registration is $500 per person and will end Sunday, March 16th. Feel free to take a copy of the TFL info board next to the registration vendor, it will update with TFL scores and news weekly! Team Fishing League Season 8 reg opens Tuesday, February 25! 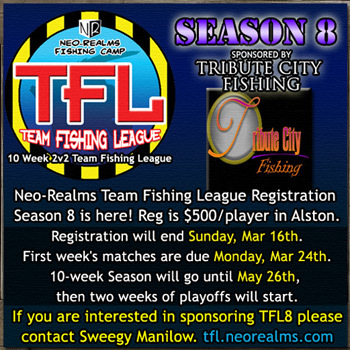 Season 8 of the Neo-Realms Team Fishing League (sponsored by Tribute City Fishing) will be open for registration Tuesday, February 25th! Registration will be available in Alston as well as our League Sponsor Tribute City Fishing's sim in Zen Events. Registration will end Sunday, March 16th. More info about TFL in the About Section or contact Sweegy Manilow with questions or sponsorship inquiries. Good luck to everyone this season!